Walt Disney was a true American and did many things during his career to help the nation, including handing over his studio during World War II as an army base and making short propaganda films to help the effort. Follow Me, Boys is dedicated to the Boy Scouts of America, an institution that close to Walt's heart. The film is based on a novel by MacKinlay Kantor from 1954 called God and My Country. 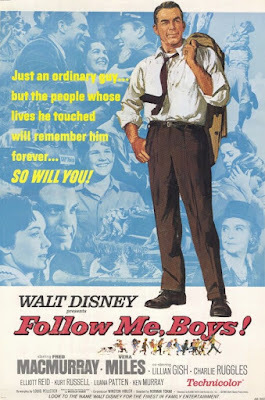 In 1965 Walt Disney released a sentimental film about small town life called Those Calloways that was a box office failure, and in many ways Follow Me, Boys seems like an attempt to correct what went wrong with that film. Louis Pelletier adapted the screenplay and Norman Tokar directs, the same screenwriter and director from Those Calloways. Fred MacMurray stars alongside some other famous Disney actors. Vera Miles plays his wife after starring in Those Calloways. Luana Patten returned to the studio for the final time after starting her career as a child actor in Song of the South. It was also the film debut of young Kurt Russell, who would become the studio's biggest star for the next decade. Other familiar faces include Elliott Reid (The Absent-Minded Professor), Donald May (A Tiger Walks) and Parley Baer (The Ugly Dachshund). This was the last film for Charles Ruggles, most recognizable as the grandpa in The Parent Trap. Exterior filming was done on Disney's Golden Oak Ranch, with interior sets filmed on the Disney Studio lot. The original working title throughout production was On My Honor. The title was changed when the Sherman Brothers wrote a song for the film called "Follow Me, Boys." The film opens with footage of a bus driving through the country as the credits roll and title song plays. Inside the bus is a traveling band. After an emergency stop in a small town called Hickory, one of the band members named Lem meets a bank teller named Vida and falls for her. He decides to stay there and gets a job in the general store. He wins Vida over by volunteering to be scout master for to start a local boy scouts troop. He meets her again later while out on a walk with his troop. Her car breaks down and the troop pushes her back. On their first date, they see a boy named Whitey stealing from the store. He hurts his ankle and Lem helps bind it and doesn't turn him in. Whitey has an alcoholic father and is the only boy in town who hasn't joined the troop. After Lem and Vida get married, he catches Whitey spying on his troop and he gets in a fight with one of the boys. When Lem steps in, he gets Whitey to join the troop. Shortly after, Vida discovers that she is incapable of having kids. At parents night for the troop. Whitey's father embarrasses him when he shows up drunk. Later that night, his father dies of a heart disorder and Lem and Vida take him in. Several years later with a new troop, Lem is kicked off the land he's been using for the scouts all these years. The owner, Mrs. Seibert, is fighting her greedy nephew who claims she is mentally unfit and is now in control of the land. Lem helps prove that she is sane in court. Whitey returns from war with his new wife and when the store owner dies, he leaves it to Lem. As Lem gets older and his health starts to turn, Whitey convinces the scouts to stop letting him be their leader since he won't step down willingly. However, they make him "scout master emeritus" and hold a big parade for him, during which every boy from every troop he ever lead shows up to congratulate him. He is also presented with an honorary law degree, which is what he would have done with his life if he hadn't been a scout master. Follow Me, Boys premiered on August 1st, 1966 and opened in theaters on December 1st. Critics were hard on the film claiming it was full of cliches and that it was too saccharine. However, audiences disagreed wholeheartedly and the film was a success, grossing almost $6 million. It was rereleased in 1976 edited down from 131 minutes to 107 minutes. It made its TV debut in 1981 and was released on home video in 1984. I'm not a big fan of Those Calloways, but I think Follow Me, Boys achieves the same desired results in a more successful way. It's a truly heartfelt film that will make you feel good and it has some of the trademark Disney fun along the way. I think critics in 1966 were overly harsh on it. While the runtime is a little long and the film allows the audience to get bored a few times, the payoff at the end is worth the wait. Kurt Russell gives an amazing performance to a role that could have been very unlikeable in lesser hands. And the adult cast rise to the challenge of playing characters at two very different ages because the film takes place over the course of twenty-some years. Some of the opening credits are jokes, including crediting the town of Hickory and listing its population (the film was made entirely in California near the studio). Follow Me, Boys is currently available on DVD. The film is presented in fullscreen, although its original theatrical presentation was widescreen 1.75:1. There doesn't appear to have been a restoration. The film flickers and is plagued with white specks and discoloration. The first four minutes also feature a bright yellow boarder surrounding the picture. Bonus features include interviews with several of the boys that played the boy scouts and a photo gallery of publicity material. The film is available on iTunes in widescreen and in HD, but the digital copy does not come with any of the bonus features. There are even a variety of NASCAR rated chairs to pick from. putlockerfreemovies.net has more information on putlockerfreemovies.